The trial seeks to determine whether targeted therapies for people whose tumors have specific gene mutations will be effective regardless of their cancer type. 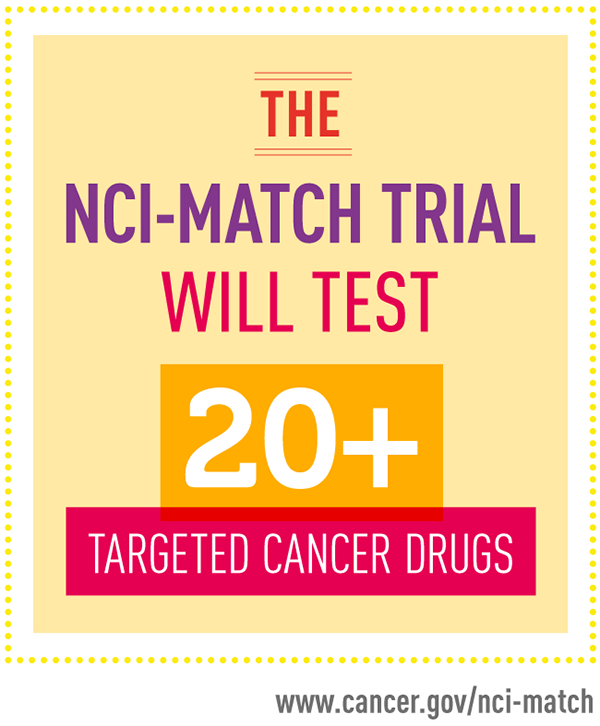 NCI-MATCH will incorporate more than 20 different study drugs or drug combinations, each targeting a specific gene mutation, in order to match each patient in the trial with a therapy that targets a molecular abnormality in their tumor. The study was co-developed by the National Cancer Institute (NCI), part of the National Institutes of Health, and the ECOG-ACRIN Cancer Research Group, part of the NCI-sponsored National Clinical Trials Network (NCTN). It is being led by ECOG-ACRIN. NCI-MATCH is a phase II trial with numerous small substudies (arms) for each treatment being investigated. It will open with approximately 10 substudies, moving to 20 or more within months. The study parameters for the first 10 arms are being sent to 2,400 participating sites in the NCTN for review in preparation for patient enrollment beginning in July. The exact date for the opening of patient enrollment will be decided shortly after the ASCO meeting. Additional substudies are in development and will be added over time as the trial progresses. The NCI-MATCH trial has two enrollment steps. Each patient will initially enroll for screening in which samples of their tumor will be removed (biopsied). The samples will undergo DNA sequencing to detect genetic abnormalities that may be driving tumor growth and might be targeted by one of a wide range of drugs being studied. If a molecular abnormality is detected for which there is a specific substudy available, to be accepted in NCI-MATCH patients will be further evaluated to determine if they meet the specific eligibility requirements within that arm. Once enrolled, patients will be treated with the targeted drug regimen for as long as their tumor shrinks or remains stable. Overall, trial investigators plan to screen about 3,000 patients during the full course of the NCI-MATCH trial to enroll about 1,000 patients in the various treatment arms. Adults 18 years of age and older with solid tumors or lymphomas that have advanced following at least one line of standard systemic therapy, or with tumors for which there is no standard treatment, will be eligible. Each arm of the trial will enroll up to 35 patients. The trial’s design calls for at least a quarter of the 1,000-patients enrolled to involve people with rare types of cancer. Since many gene mutations in tumors are infrequent or unique, screening for individual mutations is not cost-effective or efficient in clinical trials. Instead, NCI-MATCH will use advanced gene sequencing techniques to screen for many molecular abnormalities at once. Large numbers of patient tumors will need to be screened because most gene mutations occur in 10 percent or less of cancer patients. Most patients are expected to have one, or at most two, treatable mutations in their tumors. By having multiple treatments available for these genetic abnormalities in a single clinical trial, several different study drugs or drug combinations can be evaluated simultaneously. “In addition to exploring very fundamental aspects of cancer biology and therapy, this trial will bring cutting-edge molecular analysis and a large portfolio of targeted therapy treatment regimens to patients being treated at oncology practices large and small,” said ECOG-ACRIN study chair, Keith T. Flaherty, M.D., a medical oncologist at Massachusetts General Hospital and associate professor, Harvard Medical School, both in Boston. NCI-MATCH will use a single DNA sequencing test to identify gene mutations in patients’ tumors. The NCI Molecular Characterization Laboratory at the NCI Frederick National Laboratory for Cancer Research in Frederick, Maryland, has developed the test which looks for 143 genes associated with cancer that can be targeted by drugs in the trial. To ensure quality control, biopsy specimens from all 3,000 screened patients will be sent to a single location for processing: the ECOG-ACRIN Central Biorepository and Pathology Facility at the University of Texas MD Anderson Cancer Center in Houston. The DNA sequencing analysis will be done at one of four facilities using a standardized process. The cancer treatment drugs being used in NCI-MATCH include both U.S. Food and Drug Administration approved drugs as well as investigational agents that are being contributed by a number of pharmaceutical companies. Most of the arms in the trial will incorporate single-agent drugs that are either commercially available or are still being tested in clinical trials. However, a few arms will contain combinations of drugs for which there are enough safety data and evidence that they might be active against a particular genetic abnormality. Since NCI-MATCH is designed to explore whether drugs are effective against specific molecular abnormalities, patients who have tumors that can be treated with a drug already approved by the FDA for their molecular abnormality will not be eligible to use the same drug in NCI-MATCH. They could be considered for other drugs within NCI-MATCH if they have already received an approved therapy and have a different genetic abnormality that could be targeted with a new drug. There are two main clinical endpoints in the NCI-MATCH trial. The primary endpoint is the overall response rate, which is the proportion of patients in the trial whose tumors shrink by a predefined amount over a specific time period. The secondary endpoint is 6-month progression-free survival, which is a measure of whether a patient’s disease remains stable. Enrollment in NCI-MATCH will be available across the country through NCTN sites. In addition, the trial will be available through sites nationwide that participate in the NCI Community Oncology Research Program. All of the approximately 2,400 sites that participate in the trial will use the NCI Central Institutional Review Board as the institutional review board of record. Sites will access the trial under the protocol identification EAY131 via the NCI Cancer Trials Support Unit. The principal investigators who will lead the substudies are situated throughout the NCTN and its participating network groups: ECOG-ACRIN, the Alliance for Clinical Trials in Oncology, NRG Oncology and SWOG. All of these investigators have expertise in molecular studies, and many are junior researchers involved with, and being mentored by, experienced senior investigators. Patient advocates were engaged in the development of the trial and will help oversee the protocol and other aspects of the study. The National Cancer Institute leads the National Cancer Program and the NIH’s efforts to dramatically reduce the prevalence of cancer and improve the lives of cancer patients and their families, through research into prevention and cancer biology, the development of new interventions, and the training and mentoring of new researchers. For more information about cancer, please visit the NCI Web site at http://www.cancer.gov or call NCI’s Cancer Information Service at 1-800-4-CANCER. The ECOG-ACRIN Cancer Research Group is a membership-based scientific organization that designs and conducts cancer research involving adults who have or are at risk of developing cancer. ECOG-ACRIN comprises nearly 1,100 member institutions in the United States and around the world. Approximately 12,000 physicians, translational scientists, and associated research professionals from the member institutions are involved in Group research, which is organized into three scientific programs: Cancer Control and Outcomes, Therapeutic Studies, and Biomarker Sciences. ECOG-ACRIN is a Network Group in the NCI NCTN and a Research Base in the NCI NCORP. It is headquartered in Philadelphia, Pa. For more information, visit http://ecog-acrin.orgExit Disclaimer or call 215-789-3631.